As 2016 came to a close, I had a realisation. That realisation was “damn James, you are really fat”. I mean, I’ve always been soft around the edges, and there have been occasional gags about my size, but something in my brain has always gone “yeah, you could lose a bit of weight, it’s not that bad though, there’s plenty fatter than you!”. That changed, just before New Year. I saw the way my t-shirt hung over my belly and I was actually repulsed. I had to do something about it. First, I bought a Fitbit Aria. The various readouts said one at a time please that at 15 stone I was either nearly obese (BMI 29.1, obese is 30), or actually obese (27.7% body fat, 25% is considered obese). That was the trigger for me to actually start making changes to my life. To avoid building unnecessary suspense, the things I’ve done are starting to work. 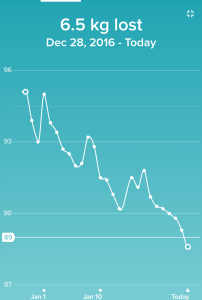 That graph represents my first month of being healthy. You can applaud a bit now. Not too much, I’ve still got a long way to go. But I think I’ve earned a bit of approval. I now weigh less than 89KG (14 stone for imperial scum). Buying the Aria and weighing in every morning (post-wee, pre-breakfast) and every evening (before bed). This A) reminds me that I am being healthy, and B) shows me my weight trend. The trend is far more interesting than any individual weigh-in. You can see a few big spikes in the graph above (representing New Year, a friend’s birthday, and a weekend at my mum’s), but none of those sudden jumps in weight depressed me, because I still had a downward trend. Honestly, the Fitbit has been pretty much the driving force for me not forgetting about my health entirely. Cooking healthy. I haven’t been starving myself. The BBC Good Food magazine has many good recipes. A few that aren’t on their website have been the most helpful. Specifically, a red pepper prawn curry and rice meal that neither me or Coralie could finish due to the sheer size of the thing, despite how delicious it is. Abandoning the breakfast of a lifetime. I’m no longer eating marmite on two slices of buttered white toast each day. It’s now an avocado on a slice of brown toast, with some hot sauce. Not eating all the cake that is omnipresent in our office. Seriously, it’s like someone robbed the Tesco bakery section and stashed it on desks near me. That’s been a real test of self-control. Not doing more exercise. I know I should, and I have tried a bit, but frankly it’s cold outside and it’s dark when I get home from work, so that will have to wait. This does mean that the weight I’ve lost has been from eating less, which has to be a good start, right? Dry January. Apart from one night off (many vodkas, drunken kebab) I’ve not had any booze since New Year. This is something I will need to account for starting in February. Anyway, that’s enough patting myself on the back. I met my Q1 goal in the first month. That means now I have to go on and do more, because I’m not where I want to be yet. I’m not telling you what that final goal is, because I think not banging on about weight loss has helped me lose weight and keep friends, but when I do get there I’ll let you know.